Hi ! I wanted to tell you a few things about the customization I have done on my Forester. 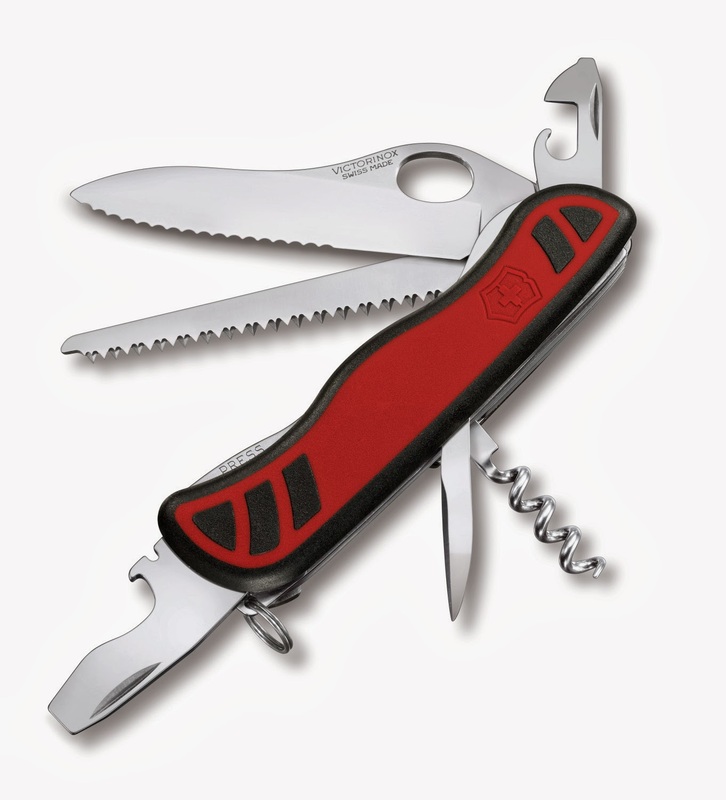 In a few words, the Forester is like the new 2008 Swiss Army Knife, with a corkscrew instead of the cross screwdriver, and red bi-material scales. I wanted to test the “one hand” blade. After a few weeks of daily use, I find it wonderful and I can’t do without, now. But the serrated blade is still a problem. It cuts very well, but it is difficult to make a straight cut, and fine work is impossible. So I found a Sentinel with a non-serrated blade and did the exchange. 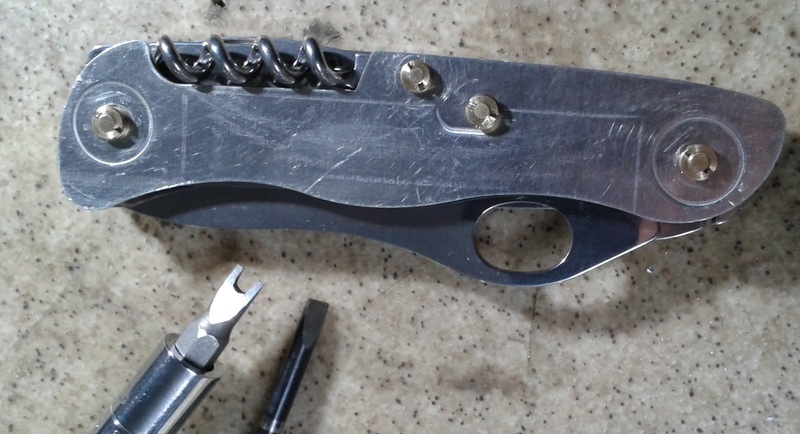 I also wanted to change the can-opener which I find useless, for a small blade that I want to keep very sharp. 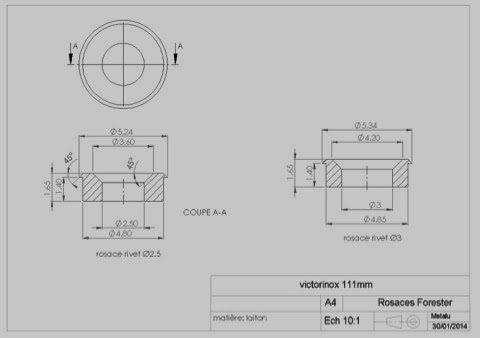 the2 main rivets are Ø3.0mm. the 2 rivets on the rear are Ø2.5mm. So I wanted to try something : instead of making new identical rivets, why not making screws with the head the same shape as the rivet heads? That’s what I did. I machined them on my toolmaker’s lathe, and so the nuts, with the same head profile. My plan is to secure the thread with Loctite threadlocking glue. The glue can be desactivated by heating at 120°C (for exemple with a small blaze) If I want to disassemble the knife again. 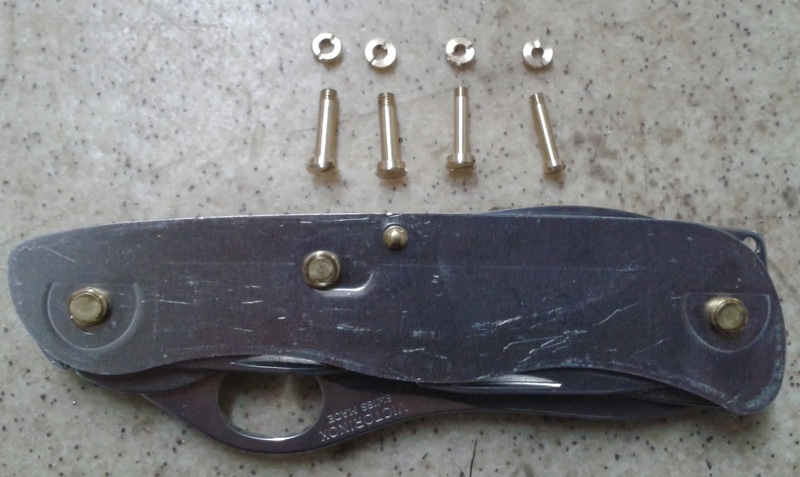 This solution enables me to fine tune the rivets’ thightening and go backward if needed. The root of the blades have the same profile. Starting well. But the thickness is 0.8mm less. A small Thickness shim should do the trick! But the samll blade from a 91mm Victorinx SAK is done to cross the long blade on the left. And here, on the left there is the screwdriver. So I have to cheat to make it go on the right. Otherwise the blade’s tip is touching the screwdriver. After taking the dimensions, I calculated that I needed 2 shims with 2° tilt. assembly test: the blade is over-tilted and is touching the stainless steel liner. Perfect! The blade is touching neither the screwdriver nor the liner. So I had to drill the small blade to Ø3. A high quality HSS drill-bit failed. I needed to use a tungsten carbid bit. Time has come to do the assembly with my specially developped assembly tools : a normal screwdriver ! and for the nuts I found a bit that fitted perfectly after grinding it to the thickness. On the following picture we can see the 2 thickness shims on each side of the small blade, and it’s alignment along the central liner, with no contact. and her it is! My wished ideal swiss army knife! concerning the Sentinel, I assembled it with the serrated blade and the rivets from the Forester. Ok, let's start off with... FINALLY!!! It took me about twenty mails to three different countries, two visits to the Flagship store in Dusseldorf, almost an insane trip to Switzerland in two days and oh, two months of waiting.... After a few negative reviews of the early releases I was having second doubts and with prices online, going from 160 Euro to 250 Euro, I had some mixed feelings about this release. On the other hand... This is a milestone in collecting Victorinox knives. I was always impressed by the way that Carl Elsener sr. ran his company and there is no more respectful way of commemorating his legacy as with a knife like this...So.... after some hesitation I went to the Flagship store in Dusseldorf and made a reservation in december for the knife, that hopefully arrived in january. A few days ago I received the mail I was waiting for. Josef Hegemann, the Dusseldorf shop manager mailed me that the knife arrived and two days later I was drooling on the display model in the shop... At the counter, the woman who gave me instructions on making my own Spartan during the last visit, showed me the model they kept aside. I wasn't really impressed, mostly because I already knew the small imperfections, mentioned on the negative reviews and I noticed rough edges on the scales, so I asked if she had some others, just to compare. I could choose from three knives and there was a lot of difference, especially in the wooden scales. One of the small details is that they didn't sand the oak scales smooth. There are some pores in the wood and this gives the knife some rough feel to it. 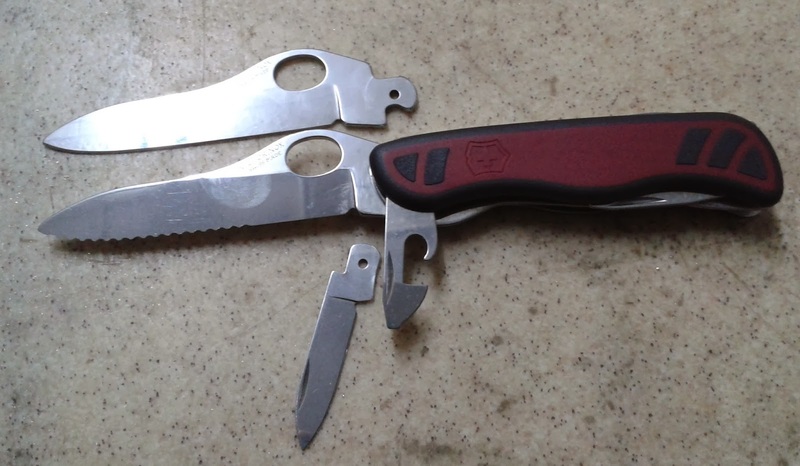 Not something "bad", just something we aren't used to by Victorinox, and some do have this more "expressive" then others. I choose for the more even surface. Other imperfections, the other reviews mentioned, weren't visible on the ones they showed me. The scales were well fitted on the outer liners and the shield fitted perfectly in the wood. This is one impressive knife. It looks good, feels good and the Damast... well... is quite unique. I love it! The knifes actually a standard Explorer with the addition of a Damast main blade. Damasteel, or the pattern used on the main blade found its origin in ancient India, where sword smiths used a unique way to forge this beautiful steel. Real Damasteel should be almost indestructible and was a source for some of the greatest legends, claiming that a Damasteel blade could split a hair and so on. Victorinox uses a more chemical technique and puts a layer on the blade. I don't know the details of this technique, but I do know that it isn't real Damasteel through and through. This should make the knife far to expensive for the average consumer. Nevertheless the blade looks stunning!!! It weighs 105 Grams , has Oak scales, a width of 27mm and a length of 91mm. It comes in a beautiful display box with a snap-closed lit and a small lucite window on top. On the front scale, the signature of late Carl Elsener sr. was laser burnt in the Oak. Behind the Corkscrew you'll find the year of production (2013), your unique production number and total produced (7000pcs). 1. 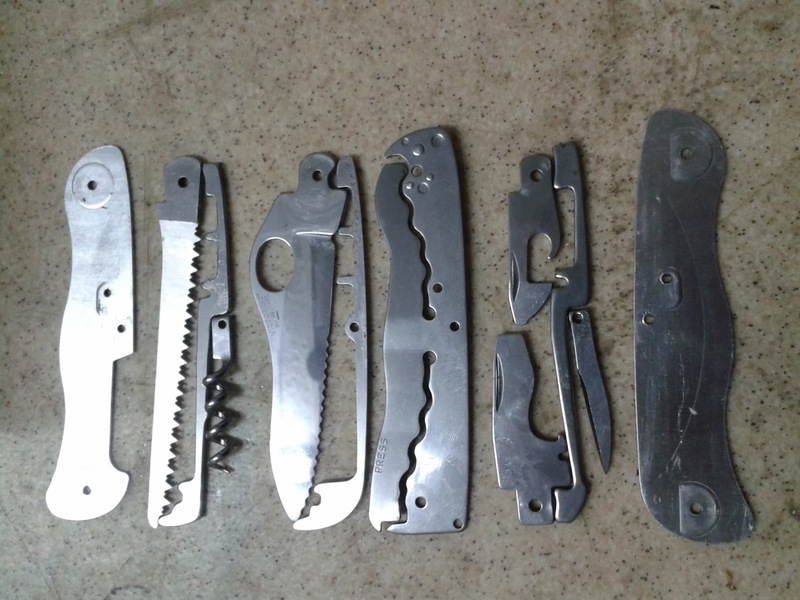 What got you interested in Swiss Army knives? 2. Do you carry one at all times? Were there any situations that you were glad to have it with you? At first I thought that people exaggerated when they told me „once you cary it for a day, you get hooked”, but after some pocket carry it just feels natural to have it on you… Now I don’t leave the house without one. At work (I’m an electrician) I always cary a Swisstool X and a Soldier model 2008 and after work a Fieldmaster and a Sentinel. 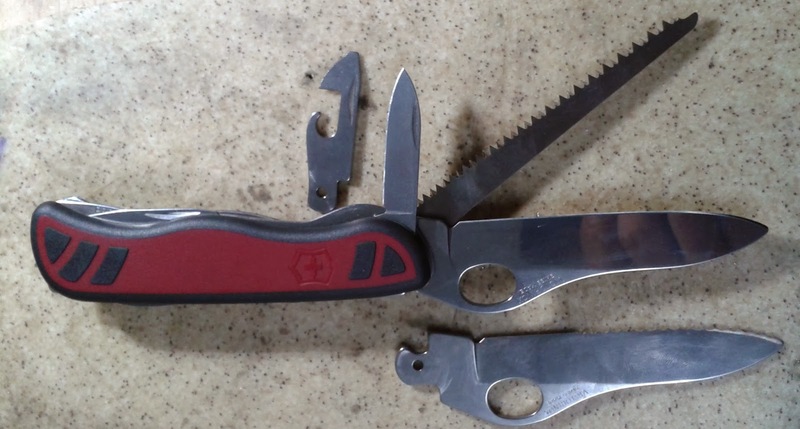 I haven’t experienced a life-treathening situation where my pocket knife saved my life, but with small inconveniences in life like a splinter, I’m glad to have one with me. 3. Do you have any advice for anyone who might want to start collecting? The best advice I could give is to choose a certain type of Swiss Army knife and to focus on that part to collect, and don’t spend a fortune on you first knives! Start collecting the knives you find on flea-markets or garage sales, instead of buying over-priced so-called „vintage” SAKs on Ebay. 4. How many do you have in your collection in total? Do you have a favorite? Right now I have about 300 „collectable” Swiss Army knives, about 40 custom SAKs and 30 or so waiting to be customized… My favorite must be the Soldier model 2008. This is by far the most toughest, user friendly SAK I own! 5. If you were to add any combination of tools to a knife, what would it be? 6. How can you tell the difference between a genuine and a fake? Hi, I'm Jeroen, born in Tongeren, the oldest city of Belgium on 19 februari 1981. My main hobby is collecting knives, and lately that changed to almost only Victorinox... After traveling to the SAK's birthplace, my hunger for more grew and I started this blog to answer your questions and mainly learn from other collectors like you... I hope you like the blog and if you do,please be so kind to leave a message in the guestbook after your visit. The company was founded in 1884. Since 1891, the company has delivered knives to the Swiss army. Their famous emblem—a cross in a shield—has been used by Victorinox since 1909. That year, the mother of founder Karl Elsener died and he named the company "Victoria" in her honour. In 1921, with the introduction of "inox" into their products, the brand and name of the company became the present "Victorinox" ("Victoria"+"Inox"). Additionally, Victorinox claims never to have had to fire or make redundant an employee for economic reasons. To do this they set aside profits during boom periods to supplement recessionary periods, as well as temporarily contracting employees to other companies as outsourced labour during recessions.